Capabilities required by the professionals in the era of Cloud Computing is not limited to IT sector but it includes the Health, Law and other professionals. One can not stay offline in this era of Cloud Computing. Almost all the Social Networks, Storages are using Cloud Computing Platform and the fact is; none make aware the general users about the needed Security for protecting privacy and secrecy. Capabilities required by the professionals in the era of Cloud Computing never means that, everyone have to know UNIX commands or Networking. We have lot of articles on the security aspect of Cloud Computing including a Comprehensive Secure Cloud Computing Guide. We can not deliver any guide for other than IT professionals, quite unfortunately. In real life, from Author’s personal conversion with Tim Cook and his practical experience, it appeared that a certain profession has some rigidity about concluding to a single point when they are asked about something. We wrote tips about Facebook Security before. The importance is that, if a certain group of professionals are not careful about the real danger of data stealing, the almost universally accepted flaws of Public Cloud Computing, others’ personal data is at risk. The risks are getting addons – Facebook for example has some Security Flaws (just an example) plus there are risks with Public Cloud. This the preface and our scope of this article is very less to the other Professionals other that IT. A recent study predicts that about 14 million new jobs will be created worldwide by 2015 as a result of the increasing adoption of cloud computing. Believe it or not, this number there is no doubt exacerbates the view that how the cloud is completely reforming compared to how IT departments are traditionally designed. Despite the promise of cloud computing to stimulate further increased the labor market, it could damper the marketability for the computer professionals, as you may soon find that your skills are no longer required in the information technology market. The skills required in today’s job market is changing radically with respect to the professional skills required in the past. The first step is to identify the right cloud computing provider. It sounds like very easy work, but it is a task which requires a precise assessment of products and services of various suppliers. While in the old IT world, professionals in the field were those people who developed the technology and made operational for the working environment in which they worked, in today’s world, they must be able to evaluate third-party services to determine if they are useful to the business of own company. Using the cloud does not mean that we should not be able to manipulate the internal environment of the company. Many organizations have legacy systems and software already installed within the company, therefore the IT experts will still be enrolled to see how these new cloud resources can be integrated with these existing systems, software, and data sources. Knowing how to integrate the new capabilities of cloud with existing resources and be able to move the data are invaluable skills in the panorama of cloud today. The popularity of cloud computing is not just about implementing a technology on trend, but it is a strong reaction to the typical stereotype, that encompass the IT professionals as well as small businesses. The cloud is not just a technology, but also a bridge between IT and adapting to the needs of the IT business. Blogs, websites, newspapers and informative can teach a lot of things regarding the advantages and disadvantages of cloud computing. But if they are still confused they can opt for certification courses provided by the various companies – Amazon, Rackspace, Google and Salesforce. Studying to become cloud providers for your company, the IT professionals of the larger companies could be professionally asked to restructure or redesign their data centers to emulate the best practices of the cloud. Regarded as an internal service provider, since cloud environments often are resting upon an architecture for performance, monitoring and management capabilities are needed to measure each parameter of the service, based on performance. This Article Has Been Shared 5367 Times! 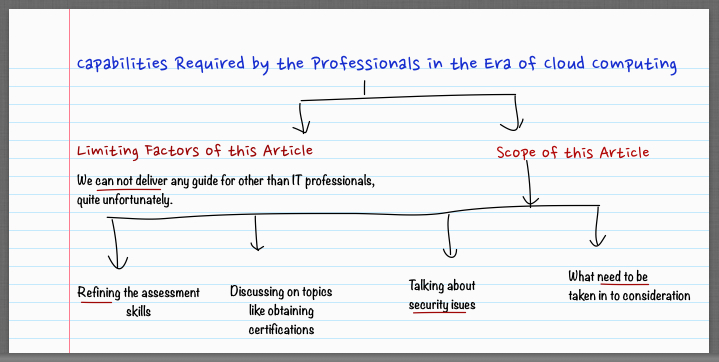 Cite this article as: Abhishek Ghosh, "Capabilities Required by the Professionals in the Era of Cloud Computing," in The Customize Windows, August 18, 2013, April 19, 2019, https://thecustomizewindows.com/2013/08/capabilities-required-by-the-professionals-in-the-era-of-cloud-computing/.